ANCIENT ALIENS ENAMEL PIN, Two high-quality enamel pins of Giorgio and David attached to a card inside a plastic sleeve. 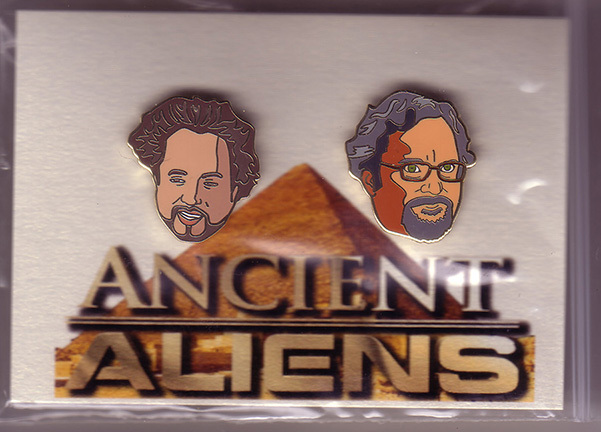 Finally, you can get this two-enamel-pin set of Giorgio Tsoukalos and David Childress from the History Channel's popular show ANCIENT ALIENS! Makes a great gift for that ANCIENT ALIENS fanatic you know! Free shipping! ANCIENT ALIENS ENAMEL PIN SET: Two high-quality enamel pins of Giorgio and David attached to a card inside a plastic sleeve.